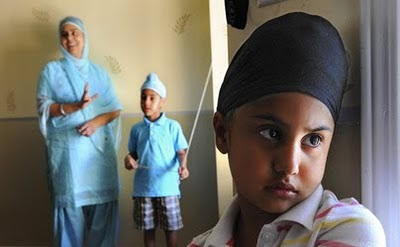 Livleen, 3, foreground, wears a turban, as does her mother Sukhpreet Kaur, 28, left, and her brother Jasjot, 5. More women reportedly wear the turban in North America than in Punjab, India. Mandeep Kaur Uppal quickly took him outside and explained that she is a Sikh and wearing a turban is a part of her religion. At a time when many young Sikh men are cutting their hair in a desperate bid to assimilate, Uppal, 28, is among a small but growing number of Sikh women in the Greater Toronto Area who wear the turban. There are no numbers available, but local Sikh leaders estimate at least a few hundred women wear the turban. In fact, there are more women who wear the turban in North America than in Punjab, India, where the majority of Sikhism followers live. Sikhism dates back to 15th-century India. Adherents are forbidden to cut their hair, considered a visible testament to connection with their creator. The turban was adopted to manage long hair and make Sikhs easily identifiable. There are varying views on whether Sikh women are required to wear the turban. They are required to keep their hair but Singh says there is nothing in history that indicates they have to wear a turban, too. She didn’t always wear one. Uppal was baptized about 15 years ago when she was a student at West Humber Collegiate Institute. For two years, she covered her head with a scarf but many mistook it for a hijab, the scarf worn by some Muslim women. That’s when she decided to wear a turban. “That’s my identity,” she said. At first, it took her about half an hour to tie it up — now, she can do it in minutes, with her eyes closed. Fashion is the last thing on the minds of turban-wearing women but they admit they “like standing out in a crowd… People always remember me,” said Preetinder Sehgal, a 20-year-old York University student who has worn a turban for eight years. Kaur’s son, Jasjot, 5, and daughter, Livleen, 3, also wear turbans. One of her favourite stories about Livleen and her turban is from last year. The Ontario Khalsa Darbar, one of North America’s largest Sikh temples at Derry and Dixie Rds. in Mississauga, holds a turban-tying contest for young men every year. Livleen wanted to participate but it was only for men. Her parent took her anyway and the feisty 3-year-old was given a special appreciation award. “She was very happy and I was really proud of her,” said Kaur. Women who wear the turban face as much of a challenge as men do, said Pardeep Singh Nagra, manager of employment equity with the Toronto District School Board. Nagra visits schools to explain the significance of a turban and demonstrates how it is tied. “Women are asked the same questions as men, and what I tell them is: Answer questions with a big smile and the best of your ability,” said Nagra, adding that the number of women who wear turbans is increasing.